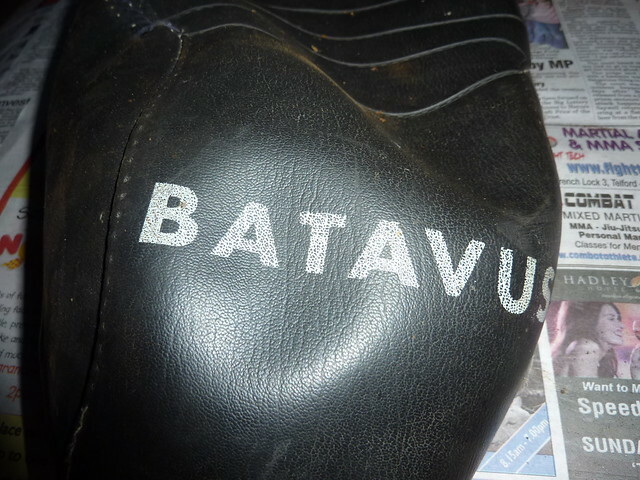 The ealier pictures of the Batavus project clearly show that the seat needed some attention, the cover being held together by lots of conspicuous re-stitching in now-rotting thread and bits of black sticky tape. I've never restored anything before, just bits and pieces of things so I'm still unsure how far I'll go with this one. I think I'd like to do a reasonable job over time but I'm not aiming for an over shiny and perfect finished article. I really prefer things to look their age ('cept me!). What I have decided is that I want to do it at no cost at all. Now this clearly isn't realistic unless I go out robbing things so I've decided that if need to buy anything for it (which I certainly will need to do) I have to fund it by selling things, mainly on ebay I expect. Wherever possible, I'll use things I already have. So far, I've paid Â£80 for the moped and Â£26 for some engine spares. I'm allowing myself the original cost and I already had a balance in my PayPal account from selling some biking gear to pay for the engine spares. Today, an item I was selling on ebay went for Â£68 (I'd been expecting about Â£40 so this was a good result). I placed an advert on the local Freecycle about a week ago to see if anyone had any vinyl offcuts to cover the seat with. I didn't get any vinyl but I did get a helpful email pointing me in the direction of Dunelm, so today I splashed out and ordered a sheet of black leatherette/vinyl with which to re-cover the seat. That's Â£10 spent, including delivery. I could have paid Â£2 extra for next day delivery but, tempting though that was to an impatient sort of person such as I, I opted for the economy 5-7 days delivery in the interests of being frugal. This afternoon, I started to carefully take the seat apart, in readiness for the arrival of nice, new vinyl. I haven't seen a seat constructed quite like this before. 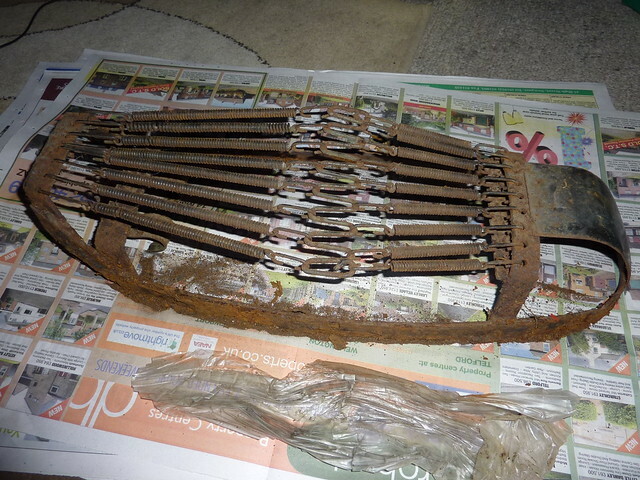 There is a metal framework for the base, with seat springs. 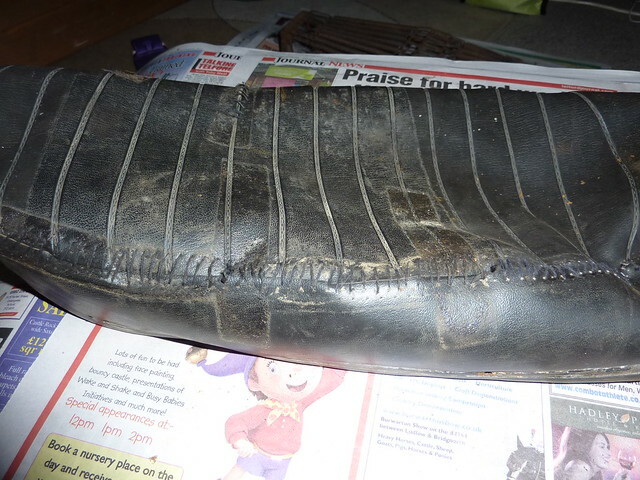 Over that is a rubber covering, made from four pieces of rubber stitched together. 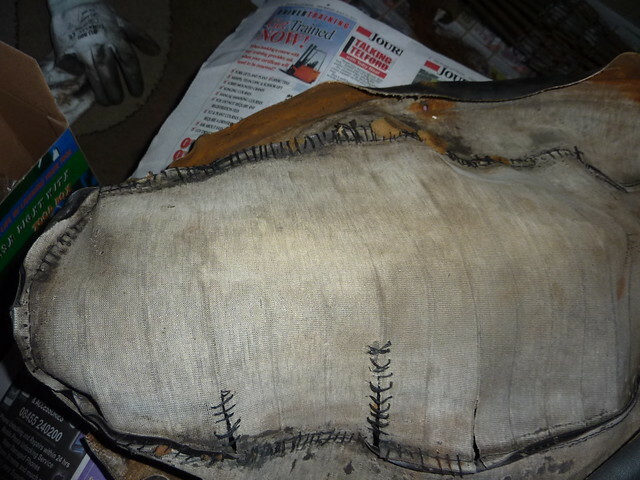 The rubber is fairly thick and holds it's shape when not fitted to the metal base but a lot of the stitching is rotten and most of it will need re-stitching. 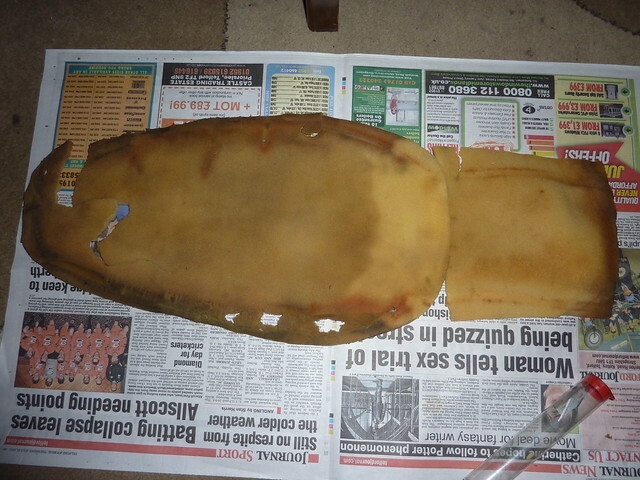 A thin layer of foam is glued to the top and back of the rubber layer and then the vinyl seat cover is fitted over the top. This is made from three pieces of vinyl stitched together. 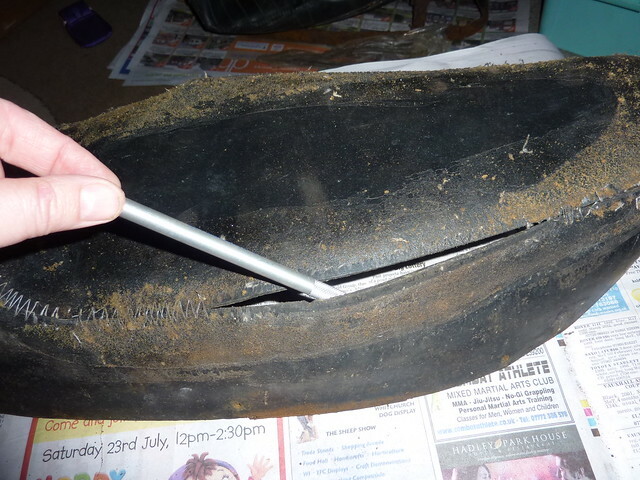 There are three holes drilled in each side of the metal frame and once the vinyl cover is in place, with the edges folded up inside the base, three tiny bolts each side go through the vinyl cover, then the rubber layer, then the metal seat base and then through the vinyl cover again before being secured with a washer and nut. Some of the original bolt heads sheared off when I tried to unfasten them, then the nuts had to be hacksawed off the inside of the seat - lots of rust! 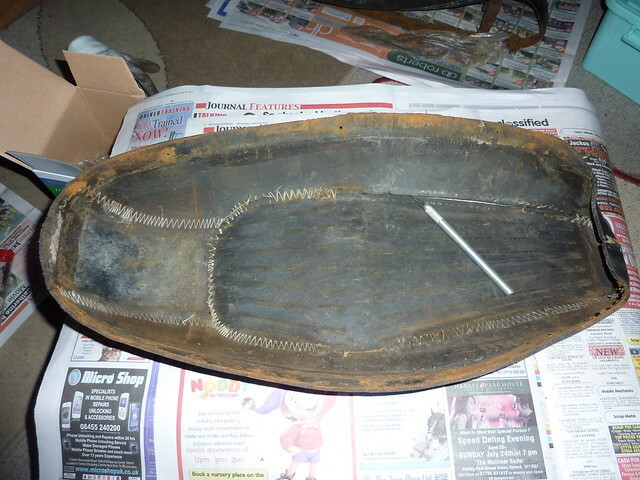 The metal base will need a lot of work with a wire brush, then some rust treatment and some black paint. I think it's a rather impressive looking base for a humble moped. The rubber cover needs restitching. Because it is quite thick and some of the old thread is stuck in the holes I will probably need to go round it all with a needle making sure all the original holes are clear before I do the actual stitching. I plan to use clear, plastic thread for this so that it won't rot. I'm quite pleased to have got the two pieces of foam off the rubber cover without wrecking them - they're in good enough shape to use for a template. Because I'll be using camping mat for the new foam it will probably need more trimming and shaping at the edges than the original foam, which is a lot softer. When I make the vinyl cover I will probably try and save the middle panel from the original as this has the ribbed pattern and the Batavus logo on the seat hump. It's had a hard life and there are several splits in it so I'm thinking I'll glue it to a piece of the new vinyl before stitching it all together - this should give it more strength and some degree of waterproofness! Using part of the original cover should also help stop it looking too Brand New - I don't want to end up having to make the rest of the bike perfect so it matches the seat! BTW, please can you measure the diameter of the downpipe on your Puch? The Batavus exhaust system is missing so I'm looking for alternatives that I can modify. I read earlier that Tomos, Minarelli and Garelli exhausts can fit and possibly Puch. I think that's a bit narrower than mine but I'll check later. Many Puch exhausts will fit Minarelli powered bikes with little modification along with Trac and Batavus motors. Yes, I was reading the Crossover pages yesterday - it was what prompted me to ask about the size of your Puch exhaust. I made too many holes in my fingers last night, while managing to just sew about an inch of the seam on the rubber layer. On Sunday, I sold an item on ebay for about Â£70 so I decided to spend some of it on a vinyl repair kit that shouldn't involve bleeding fingers. Also sent an email off to Mopedland enquiring about buying one of the covers that Codger found there, plus some tyres and tubes. sfb wrote: I made too many holes in my fingers last night, while managing to just sew about an inch of the seam on the rubber layer. On Sunday, I sold an item on ebay for about Â£70 so I decided to spend some of it on a vinyl repair kit that shouldn't involve bleeding fingers. Also sent an email off to Mopedland enquiring about buying one of the covers that Codger found there, plus some tyres and tubes.